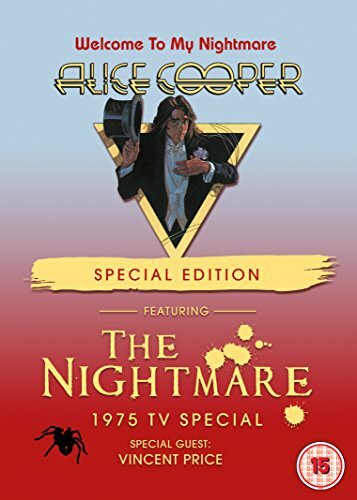 This special edition DVD feature from Alice Cooper includes the 1976 concert film "Welcome To My Nightmare" and, appearing on DVD for the first time, the 1975 TV special "Alice Cooper: The Nightmare". "Alice Cooper: The Nightmare" is the rarely seen 1975 TV special that aired on ABC, in conjunction with the release of the legendary "Welcome To My Nightmare" album. The TV special stars Alice Cooper as Steven and Vincent Price as The Spirit of the Nightmare, and showcases every song from the "Welcome To My Nightmare" album, including Only Women Bleed, Department of Youth, Cold Ethyl and the title track. "Welcome To My Nightmare" features hits and classic songs, including I'm Eighteen, School s Out, Only Women Bleed, No More Mr. Nice Guy and, of course, Welcome To My Nightmare. The nightmare vividly comes to life on the rock stage, bringing forth a plethora of skeletons, giant spiders, a cyclops, the "magic" movie screen and the voice of horrormeister Vincent Price, all designed to thrill you and keep you uneasy in your sleep. View More In Special Editions.